Edison NJ – Fuji Electric Corp. of America is pleased to announce our Portable Ultrasonic Flowmeter received the 2018 Good Design Award. “This award has been a sole comprehensive design evaluation and commendation system in Japan since 1957. Many companies and designers from both inside and outside of Japan participate in the activity to enhance the industry or the quality of life through the design. “G Mark”, the symbol of the award has been recognized widely as a mark representing good design”, as stated on the Good Design Website. The product was submitted for consideration by Fuji Electric Co., Ltd. in Japan. The portable type ultrasonic flowmeter consists of a compact and lightweight flow transmitter and a clamp-on detector. With the latest electronics and the digital signal processing technology, it delivers precise measurement while allowing easy operation. Handy and battery-driven design allows you to take measurement when and where needed. 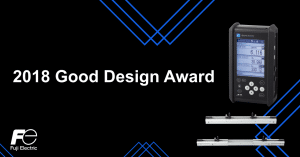 Learn more about the Good Design award and visit our website for more information about our Instrumentation product line. Fuji Electric Corp. of America is a wholly owned subsidiary of Fuji Electric Co., Ltd., headquartered in Tokyo, Japan and has been responsible for sales and distribution of the company’s products since 1970. Fuji Electric Co., Ltd. began developing power electronics equipment in 1923, and is a global leader in industrial products ranging from semiconductors, HMIs, contactors, relays, and power generation equipment to AC drives and uninterruptible power supply systems. For more information, please visit https://americas.fujielectric.com/or follow us on LinkedIn and Twitter.